The Japan Society for the Promotion of Science (JSPS), or widely recognized as “Gakushin” for short, is an independent administrative institution, established by way of a national law for the purpose of contributing to the advancement of science in all fields of the natural and social sciences and the humanities. JSPS plays a pivotal role in the administration of a wide spectrum of Japan’s scientific and academic programs. While working within the broad framework of government policies established to promote scientific advancement, JSPS carries out its programs in a manner flexible to the needs of the participating scientists. JSPS was founded in 1932 as a non-profit foundation. Over this 80-year period, JSPS has worked continuously to develop and implement a far-reaching array of domestic and international scientific programs. On October 1, 2003, JSPS entered a new phase with its conversion to an independent administrative institution, as which it will strive to optimize the effectiveness and efficiency of its management so as to improve the quality of the services it offers to individual researchers, universities, and research institutes. To collect and distribute information on scientific research activities. For details, please visit the JSPS headquarters’ website. 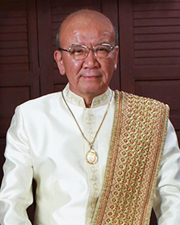 Launched in 1989, the Bangkok Office was the third overseas liaison office to be established by the Japan Society for the Promotion of Science (JSPS). Centrally located within Southeast Asia, the office works to promote scientific exchange with Japan throughout the region. To date, the office has had 15 directors. Their wide spectrum of specializations from the humanities and social sciences to the natural sciences has added much depth and breadth to the office’s programs. In July 2012, Prof. Kuniaki Yamashita., Former Dean and Professor, Faculty of Languages and Cultures, Kyushu University, was newly appointed as the 16th office director. In 1978, JSPS signed an MOU with the National Research Council of Thailand (NRCT) to promote collaboration in fields of the natural and social sciences and the humanities between Thai and Japanese researchers. Many of the JSPS Bangkok Office’s activities are carried out with NRCT’s strong support and cooperation. Recently, JSPS Bangkok Office supports JSPS alumni association for following up JSPS former fellows’ activities. Currently the office supports Thailand, Bangladesh, and Philippines. To provide liaison between JSPS and universities and academic institutions in the region. To serve as an information hub for academic cooperation between researchers in the region and Japan. To maintain and strengthen relationships with former JSPS fellows and program participants. To assist Japanese researchers, administrators and others who visit Thailand or other areas of the region for the purpose of international scientific exchange. When I took office as Director of JSPS Bangkok Office in July 2012, there were only 15 Japanese universities which have branch offices in Bangkok. As of now (March, 2018) it has increased up to 50. One reason for it is that as Bangkok is situated at the center of ASEAN region, many Japanese universities chose this city as a strategic point for the further development of academic exchanges with ASEAN universities. Policy of Japanese government, especially the Ministry of Education, Culture, Sports, Science & Technology (MEXT) supports globalization of Japanese universities by providing such projects like “Re-invent Japan”, “Global Human resource development” and “Top Global University Project” entrusted to JSPS for example. By making best use of this appropriate location of our office in Bangkok and so as to respond to the needs of those universities, I would like to contribute to the internationalization of universities of both Japan and ASEAN countries.